THE SMOKE OF A TIRE WAREHOUSE FIRE LOOMED OVER BUTTE like an atomic bomb’s mushroom one day last June — the very day that 225 architects, historians, folklorists, tour guides, preservationists and city planners explored the historic Uptown as part of the 30th annual national Vernacular Architecture Forum (VAF). The blaze itself echoed a dismal chapter in Butte’s past — the “fire season” of the late 1960s to the early 1980s, when many historic buildings were destroyed by arson and other fires resulting from neglected electrical systems. The irony was not lost on the visitors, most of them sensitive to the range of values that preserved architecture gives to any town: From encouraging tourism and infusing revenue to preservation-related businesses, architectural preservation stimulates economic development by stabilizing buildings, enhancing the value of rents and increasing property values. Cultural and history-based tourism is the fastest-growing segment of the travel industry. High-end architecture took their breath away, too. The unexpected juxtaposition of the luxurious millionaires’ Silver Bow Club with nearby mineyards and simple shotgun homes drew gasps. Just a few steps away, the vacant but once elegant O’Rourke Apartments serve as a reminder of what has almost been lost in Butte, and of the struggles ahead to keep such places and make them useful. The O’Rourke — actually two attached structures built in 1892 and 1908 — is trimmed in pinkish dolomite, a rock similar to limestone that was likely imported from Manitoba, Canada, to decorate the building. The O’Rourke’s dolomite décor is unique in Butte, but the building was nearly lost about six years ago to create a parking lot for the new county jail. The local grass-roots volunteer organization, Butte Citizens for Preservation and Revitalization (Butte CPR), paid back taxes, commissioned a structural analysis that showed the place to be sound, and helped find a new owner to clear a cloudy title. Today, Butte’s unenviable economic situation means that even when owners are prepared to refurbish buildings like the O’Rourke, it is difficult to justify doing it. So the O’Rourke stands empty — but it does still stand. A well-preserved speakeasy in the basement of the 1912 Rookwood Hotel served as a reception venue for the VAF. The rediscovery and opening of the Rookwood Speakeasy Museum in 2004 spurred the growth of history-based tourism in Butte. Like the O’Rourke, the Rookwood boasts unique architectural touches — a four-story façade of yellow and green ceramic tiles, and a ponderous copper cornice. Even in copper-rich Butte, the use of copper architecturally was a loud statement of prestige. Only a few buildings used copper where others used tin or stone. A notable exception is the Metals Bank with its copper arches, window casements, and cornice. The struggle to save Butte’s physical architectural heritage — its buildings — ranges from multi-story business blocks to simple miners’ homes. The fabric of Butte’s multi-ethnic history centers on the working class, and together with Anaconda, Butte retains some 6,000 contributing historical properties in the nation’s largest National Historic Landmark District by contributing property count. Most of those places are little houses — some collapsing through neglect, some purchased from the county through a developers’ packet procedure for as little as $500 and returned to use and to the tax rolls. The sheer number of historic homes in Butte and Anaconda presents a problem — with so many, it becomes a challenge to argue successfully for saving “just another little cottage,” even when its removal might destroy an otherwise nearly intact streetscape or historic neighborhood. While a few hundred historic buildings have been saved by private owners and commercial developers, often with help from grants provided by Butte CPR or the county Urban Revitalization Agency, since Butte was designated a historic landmark in 1961, more than 300 historic buildings have been lost and more are lost every year. To continue preservation, funding is needed in the form of grants or loans, especially to single-property private owners to do their own restoration. Education on the value of historic preservation can help, but without financial support many of the buildings in classic working-class neighborhoods will be lost. Juxtaposition was one theme of the Butte VAF conference — the juxtaposition of miners’ cottages with Victorian mansions on the same streetscape as a bay-fronted four-plex or a boarding house, all with a huge gallows frame looming in the background. Butte was never part of the cowboy West. It became the only urban, industrial metropolis beyond gateways like Minneapolis, Denver, and Seattle — and its wealth meant that it could boast stained glass windows in its homes, churches, and businesses; glass imported from prestigious manufacturers in New York, Chicago, Minneapolis, and San Francisco, as well as glass made in Butte’s own stained glass factory — the only one in Montana. Editor’s note: Butte Citizens for Preservation and Revitalization offers annual summer tours focusing on home restoration techniques (“Dust to Dazzle tour”) and historic stained glass as well as instructional workshops on repairing historic bricks, windows and hot-water heating systems. Old Butte Historical Adventures provides three different guided walking tours ($10 per person; all year by appointment; 406.498.3424) in Uptown Butte visiting the Rookwood Speakeasy and numerous other locations. The Chamber of Commerce (406.723.3177) trolley tour of Butte ($10 per person; May through September) showcases the history expressed in architecture. Tours of individual historic architectural places are offered at the World Museum of Mining, Copper King Mansion, Mai Wah Museum of Chinese Heritage, and the Dumas Brothel Museum. A juxtaposition of styles characterizes Butte, MT. A simple bay-fronted Italianate cottage of Granite Street is flanked by Queen Anne and Mediterranean-style mansions. With more than 6,000 historic properties, the Butte-Anaconda National Historic Landmark District spans more than half a century and dozens of ways of living and working. 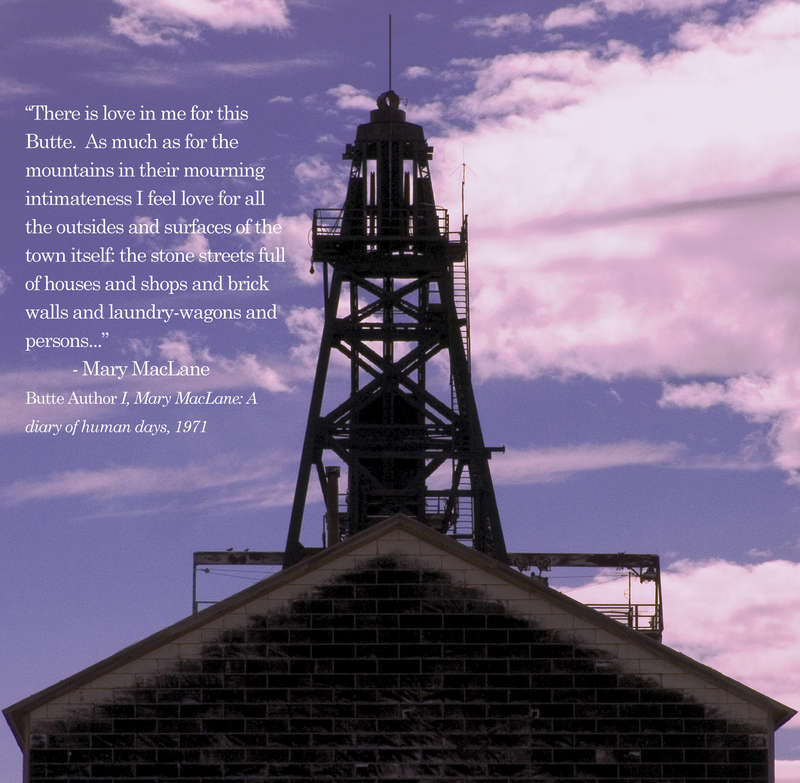 Copper kings and copper miners, grocers and sawmill magnates all lived and worked within a congested metropolis as Butte grew from a ramshackle mining camp to the largest city in a vast area of the northwest. Center: The O’Rourke — actually two attached structures built in 1892 and 1908 — is trimmed in pinkish dolomite, a rock similar to limestone that was likely imported from Manitoba, Canada, to decorate the building. Even in copper-rich Butte, the use of copper architecturally was a loud statement of prestige. Only a few buildings used copper where others used tin or stone. Wrought iron was created in local foundries, making it accessible to Butte’s middle class.